As reported in some recent news regarding HP TouchPad it came to light that a few independent developers were really working hard to bring Google Android to this device. And now we can say that this process is progressing very fast. Just after that TouchDroid team has managed to show off the support for multitouch input on the tablet, a developer along with a CyanogenMod team even posted a video showing some of their developments on the tablet. The video shows the touch screen working, the accelerometer is working and the graphics drivers are in place. Even the multitouch capability is also working with the model. But till now the Wi-Fi might not be working as it seems that the developer whoever is demonstrating to have connected net via USB cable. The factory operating system webOS provided with the TouchPad was earlier reported to be quite sluggish, though the model contains Qualcomm Snapdragon processor with a speed of 1.2GHz. But in the video provided it shows the developer is already using an Android 2.3 Gingerbread which means they have already been successful with Android. With this pace of the developers it won’t be too far when actually CyanogenMod 7 works out and gets uploaded for anyone to download and install it on the tablet. 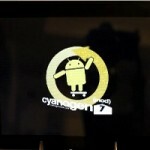 Adding to the joy of the users is the fact that CyanogenMod 7 will be dual booted with the webOS, which means both the OS will be working and we won’t need to uninstall the webOS just to try out Android on the Tablet. While regarding the news on development so far, the CyanogenMod developer claims that the TouchDroid team only managed to get the touchscreen working on the tab by modifying a CyanogenMod driver. So may be a little more time needed for us to receive the total update ready for installation to come out.